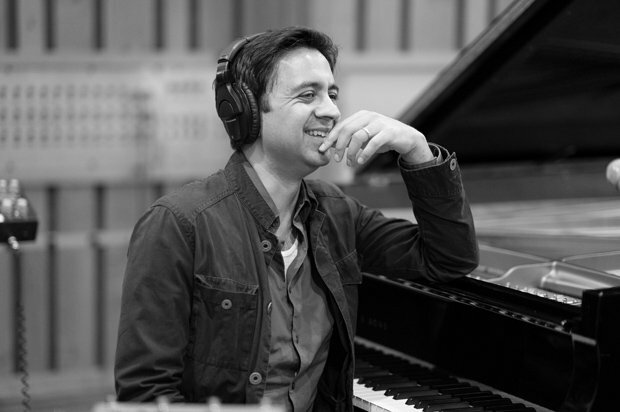 Vijay Iyer, who brings his acclaimed Sextet to the Edinburgh Jazz & Blues Festival on Tue 17 Jul, is one of the leading pianist-composers in contemporary jazz – although like many of his mentors and peers, he resists genre labels. This radical openness defines Iyer's music, which dissolves boundaries between mainstream and avant-garde jazz, classical music, hip-hop, funk and electronica. He's just at home playing compositions by jazz greats like John Coltrane and Thelonious Monk as he is reinterpreting pop hits by M.I.A. or Michael Jackson. Iyer has also written concert music, such as Radhe Radhe: Rites of Holi, a 2013 collaboration with filmmaker Prhashant Bhargava. A 2013 MacArthur Fellow and Harvard Professor of Music, Iyer has undertaken a formidable range of projects since he emerged in the 1990s as a sideman to the innovative saxophonist Steve Coleman. In addition to various solo and group projects, Iyer has regularly collaborated with the saxophonist Rudresh Mahanthappa, spoken word artist Mike Ladd, and the veteran avant-garde trumpeter Wadada Leo Smith, with whom he recorded the beautiful duo suite A Cosmic Rhythm With Every Stroke. What have you learned from working with Wadada Leo Smith? I've learned a tremendous amount from him. A lot of knowledge is conveyed in the process of creating together: about how to listen, how to relate, how to deal with time and space, how to wield the power of sound in a way that really communicates and really affects people in a way that's healing and not just manipulative. To do it in a way that cares for people. It's like radical empathy. In fact, the word 'Wadada' actually means love. That's who he is. He's got the biggest heart of anyone I know. It's that quality of listening that radiates empathy and compassion. I hope that sometime in my lifetime I'm able to achieve that level of attention and care to the process and to the people around me. Are there particular qualities you look for in your collaborators? I think it starts with the human connection. We're all improvisers and we're all creative people making choices every step of the way. Those choices are informed by how you listen and also what you know and what you feel is necessary in a certain musical context, or in a moment in time – what is the choice you make in that instant to carry the situation forward? That's the kind of wisdom that you seek from collaborators when you're engaging in that kind of music making. You want people who have that kind of total perception of what's happening and have some sort of foresight about how to build from where we are. That's basically how I put this sextet together, for example. We're going to steer this together, we're going to make choices that contribute to the whole. Certainly, there's music that I wrote and it has its own identity, but it also has a huge amount of space so a lot of things can happen. So in that sense it's like curating a conversation, and in another sense it's like some kind of collective action, in the political sense of people putting their bodies on the line together. Your Sextet, which features bassist Stephan Crump, drummer Tyshawn Sorey (replaced by Jeremy Dutton on this tour), trumpeter Graham Haynes, alto saxophonist Steve Lehman, and tenor saxophonist Mark Shim, released its debut album, Far From Over, on the ECM label in 2017. How did it come together? This sextet actually started in 2011. I was invited to do a larger project at an outdoor festival in New York. I wanted to do something a bit more extroverted, something that would communicate across a yard. I wanted to reach peoples' bodies in a way that actually engages them more directly, more physically somehow. So this music has that kind of kick to it. It still has a huge range in terms of the colours and energies it traverses but there is at the heart to it a kind of groove sensibility and a bit of a harder edge in the sense that it hits you. Even in bringing in these particular horn players, it's about striking a particular balance. And you know, this is a familiar format for anyone who's familiar with the history of this music. Kind of Blue to give an iconic example, Andrew Hill's Point Of Departure – there's no shortage of examples of this particular line-up of piano, bass, drums and those three horns in particular. So you want them to each have different things to offer, based on different personalities or different sounds, different ways of dealing with time and space. These are three people I knew well, each has their own wisdom about that process and they're very interdependent in the way that they listen. How does it compare to your trio, which also features Crump? It does expand the palette in that sense of starting from my trio and then adding wind instruments. Everything that happens in the trio is by hand and that connection to the lungs or to the voice is more distant or more metaphorical. If I play lyrically I'm still just pushing down buttons on the piano, it's not like I'm singing to you. It's a bit of an illusion. That's not to say it can't be done, but the way it happens is partly through a suspension of disbelief. Wind instruments are supported the same way the voice is supported, with a column of air that's in the body. So that connection to the breath is something quite different from what we do [on piano, bass and drums]. That's an important contrast – it expands the palette in a very specific way. There's so much to tap into in the history of horn sections, from the Basie band to Tower of Power. It's in the way they can drive the rhythm, sit inside the rhythm, they can also sit across the rhythm, move across it in a way that's more ethereal. So I try to figure out all those different ways of using that particular sound in time. And each of them has a really strong sense of pulse. Graham Hayes in particular, he can play in ways that seem timeless, in the way he'll play these long phrases that arch across many measures of rhythm. But he's super solid as time keeper. His father is Roy Haynes, so drumming has been in his life since before he was born. So that strength with pulse is a huge part of it. One of the ideas behind the album is to explore different kinds of dance rhythms and dance impulses. Am I right to hear a nod to J. Dilla on 'Nope' in the way the bass drags behind the beat? [chuckles] Well, Dilla is himself influenced by a whole tradition. He became an iconic representation of it in the digital realm in the way that he would sample and juxtapose rhythms and create this feeling. But that feeling is older than him. The idea of laying back across the backbeat, that's at least 50-60 years old. I'm a big fan of James Brown's bands, and Buddy Miles, and The Meters – all the stuff Dilla sampled. So for me it's older than that. I think it became current again in the way that there's been all this overlap in terms of people dealing with that world and dealing with this one. It was never far away to begin with. People got more involved in, shall we call it the science of feel, like how do you make a rhythm feel this way? What are the steps you take? ButI listen to Ahmad Jamal for that quality too. In fact that's part of my dissertation [on musical cognition] analysing the way he would lay back. I wrote that more than 20 years ago. And Dilla was of course working with Busta Rhymes and De La Soul and people like that in the '90s and those are all in constant rotation for me. He also had an under-recognised role in D'Angelo's album Voodoo. I think that became a touchstone for a lot of us in that moment. Not just the sound of it, but the feel of it, the way that these rhythms were at odd angles – it makes you feel pleasantly asymmetric. It worked because it expressed an aesthetic that was already present and he carried it forward into this slightly more digital context. Another important influence is that of Carnatic music from southern India. That element has been present in my music since I started making music. There's some rhythmic element like that in almost everything I've done. It's a certain way of dealing with rhythm. It's a system unto itself, that's distinct from African and African diasporic rhythms. I've tried over the years to merge those two systems of knowledge about rhythm and try to put them in contact with each other. So I'd say the title piece from Far From Over, and the first piece 'Poles', even in the way that I write these horn figures, often there will be these rhythmic cadences, it will be like a figure that's repeated a few times and resolves to the downbeat. That's a common technique from Indian drumming and Indian melodic phrasing. So it's kind of everywhere. What can we expect in Edinburgh? I'm sure the music is always changing, but will there be new material too? Well, there's the fact that both the music on Far From Over and [his 2015 trio album] Break Stuff derives from a larger suite that we did five years ago with a large ensemble. So there's material that's been broken off from that suite, which was called Open City. That was a collaboration with the novelist Teju Cole. So there are a lot of little fragments from there that we've expanded on and recast as trio and sextet music. There's a piece on Break Stuff called 'Hood', which is a homage to Robert Hood, the Detroit techno pioneer. But it was originally a sextet piece. It had a rhythmic drive to it that was orchestrated across the sextet, and then when we started doing a trio, it was like a dub version where all the horns are muted [laughs]. So that's how the trio version of that song evolved and became what it is. But it was originally a sextet piece and that's now back in the repertoire. I think the other thing is that we've gotten to tour a lot in the last year, before and after the album, and especially the last few months. We did a week at the Village Vanguard, and that's when things became much more fluid. It's not like I had to call out a setlist, we just navigate through the music together, be really spontaneous together. Now it feels like a band that has its own life, that can move with its own intelligence and its own power so I don't have to drive it. Vijay Iyer Sextet & Zoe Rahman Trio, Assembly Hall, Tue 17 Jul, 8pm. Everyone in NY recognizes that Iyer is the most over-hyped musician in the States. He a strategic, calculating person who invested in a publicist early. Tourists go see him not Avant jazz fans. The music is mediocre fare, he’s all ego.